Australia[‘s puppet PM doing the bidding of his corporate arms dealer masters] has said it plans to become one of the world’s top 10 defence industry exporters within a decade. Manufacturers would now be offered government-backed loans to stimulate the industry, [kiss-arse squib, Guab’gina Gil, you puny earthling] PM Malcolm Turnbull said. Aid groups [bleated harmlessly as they] said the move would not help global efforts to build peace, an assertion rejected by the government [time warp]. The nation[al embarrassment, doing a mind flip] said it would primarily focus on boosting exports to the US, UK, Canada and New Zealand, but it would also target markets in Asia and the Middle East. “This is all about [killing other people so as to safeguard a half-dozen or so Eddie-level] Australian jobs,” Mr Turnbull told reporters on Monday, adding that “the goal is to get into the top 10”. The [latter-day colonial wish for federation space] expansion includes setting up a A$3.8bn loan scheme to help Australian companies sell [killing machines, erm um blasters, ] defence equipment overseas. The government will also establish separate agencies to better [kill] co-ordinate [maim] and promote [murder through] industry exports [and a mass shadow generator of Turnbull’s own twisted design]. [unable to contain the hypocrisy] Defence Industry Minister Christopher Pyne said prospective buyers would face stringent checks to ensure “[we] don’t get into markets where we don’t want to be” [from the deck of his personal Eclipse Class dreadnought]. 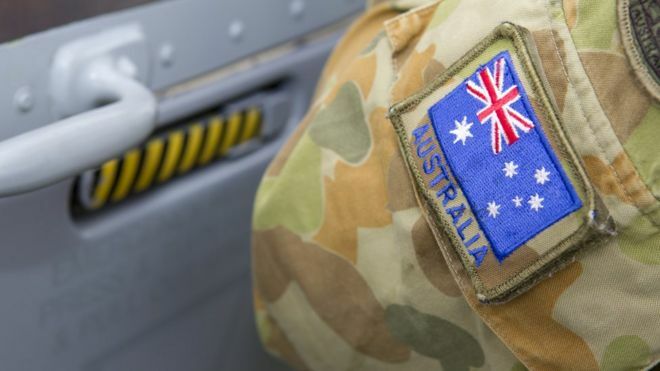 Critics said Australia should not deepen its [pockets through yet more corrupt] investment in defence exports. [in the first somewhat sane voice of the day, we heard on Millennium Falcon radio that] “We should not be getting into the game of marketing weapons which kill, maim, and bring great sorrow and destruction to communities around the world,” Marc Purcell, chief executive of Australian Council for International Development, told the Australian Broadcasting Corp.
Robinson Crusoe as a 1947 Soviet film… and a 1980 English [1870s] French operetta.